From a manufacturer’s perspective, automotive and aerospace, despite their proximity in the dictionary, couldn’t be more different. Where “low” part volumes in automotive can number in the tens of thousands, in aerospace these numbers exceed what’s required for even the largest part runs. Automotive stamping presses form various grades of steel and aluminum alloys as well as more exotic materials used in electronic and exhaust systems. But aerospace takes exotic one level further with titanium, Inconel and Hastelloy alloys as frequent part ingredients, making aerospace component manufacturing one of the most challenging metalforming applications. In its 51st year, Weldmac Manufacturing Co., El Cajon, CA, knows well what makes aerospace supply so unique and has taken the steps necessary for success in that sector. To distinguish itself from the tooling crowd, the company first added sheetmetal fabrication capabilities such as press-brake forming. Over the years, Weldmac has brought more sheetmetal-processing equipment inhouse, including presses, laser cutters and spin machines, while also building its assembly capabilities. Today, the 150-employee job shop occupies 100,000 sq. ft., with two satellite buildings providing 30,000 more. “We’ve had a great deal of success in supplying turbine-engine components such as combustion liners and housings as well as detailed parts for aerospace customers,” Rugg says, explaining the company’s product mix. Weldmac recently added a six-axis fiber laser as well as new welding and machining equipment. 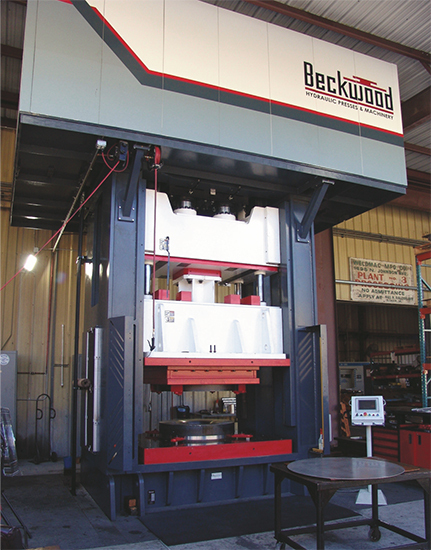 Its latest shop-floor resident: an 800-ton triple-action hydraulic press from Beckwood Press Co., St. Louis, MO. The new press increases Weldmac’s capacity and supports its existing 150- and 450-ton triple-action presses. Weldmac’s new press joins this 5000-psi sheet-hydroforming press, installed in early 2016, which doesn’t require mated tooling or secondary finishing, yet yields complex, net-shaped parts. “We’ve considered bringing in a press of this size for a few years, but business conditions did not support it,” Rugg says, noting that military and commercial aerospace orders have picked up recently after a lull earlier this decade. The new custom press, installed over the summer, is the second Beckwood machine in Weldmac’s arsenal. The first, a 5000-psi sheet-hydroforming press, was delivered in January 2016. Given the frequent tool changes required in a job-shop setting, sheet-hydroforming technology is an ideal choice for Weldmac because it doesn’t require mated tooling or secondary finishing, yet it yields complex net-shape parts with smooth, scratch-free surfaces. With a large 6 by 7-ft. forming area, the new triple-action press doubles Weldmac’s overall capacity and tonnage capability. 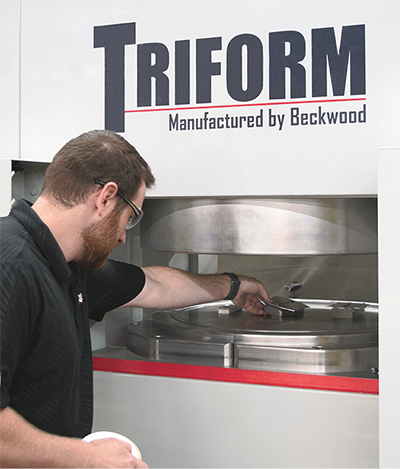 Due to the complex part geometries and frequent off-center loading, Beckwood engineered a gib-guided press not only to accommodate Weldmac’s existing part family, but also to support future growth with larger parts. A PLC, absent on Weldmac’s existing triple-action presses, allows for a consistent and repeatable process. Similar to Weldmac’s existing triple-action presses, the new machine forms a variety of high-temperature alloys. Forming difficulties inherent in these materials make a triple-action press an excellent choice, according to Dixon, who explained the workings of this technology. The clamp ram also features individual tonnage control on each cylinder. “If operators want one corner of a sheet to flow inward more rapidly, they can reduce tonnage on that cylinder, while increasing tonnage on the other side to provide more holding force,” says Dixon. In addition to large-part capability, Beckwood designed the press with added versatility to handle smaller parts on jobs off-loaded from some of Weldmac’s older presses. The main ram offers capacity from 80 to 800 tons, with the clamp-ram bolster providing 10 to 300-ton capacity. The new press will help Weldmac handle an uptick in exhaust components produced for commercial stationary turbine engines as well as its thriving aerospace-supply business. It also brings more to the table.